The science of astronomy has been around for centuries. Astronomy can be defined as the branch of science that deals with celestial objects, space, and the physical universe as a whole. Astrology, on the other hand is the study of the movements and relative positions of celestial bodies and the interpretation of them having an influence on human affairs and the natural world. However, how much correlation is there between astronomy and the zodiac signs? Zodiac signs are known to be based around constellations and the Sun, and are used to tell fortunes, predict personality, and much more. Astrology is an in-depth field of study that focuses on the circular path of the sun through the celestial sphere at different times throughout the year. In relation to the constellations, the sun passes through one at the time of an individual’s birth designating them a zodiac sign. How did astrology develop, and what makes it different from the science of astronomy? Astrology is the study, or observation, of how the Sun, Moon, and planets interact, and is an inference due to the observed correlation of events; however, this does not mean that correlation implies causation. Astrology has been viewed as a legitimate source of information by many of cultures for a number of years. There are two types of astrology: mundane astrology focuses on events and natal astrology focuses on people’s birth charts3. Astrology is centered on the arrangement of the planets at the exact moment of our birth and it purports to give us insight into all parts of our character and potential. This also includes horoscopes, which are diagrams of the planetary positions from a geocentric (Earth-centered) point of view. 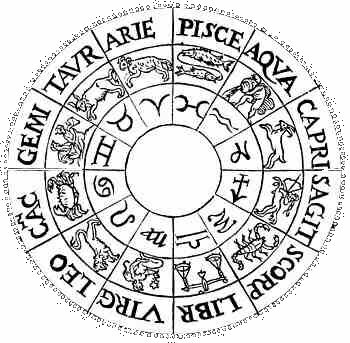 A person’s horoscope is the astrology chart drawn for the exact time, day, year, and location of your birth. These horoscopes are used to understand human behaviour, discerning strengths and weaknesses, and personality insights. Astrology takes into account the ebb and flow (a recurrent or rhythmical pattern of coming and going or decline and growth) of energy across the universe regulated by the planets, Sun, and Moon4. The Babylonians are the ones who are credited for the birth of astrology. The Babylonians’ astrological charts enabled them to predict recurrences of seasons and celestial events5. For more than 2,000 years astrology and astronomy were considered the same science. Later on, astrology was used to predict weather patterns, mostly used for agricultural purposes. Astrology was broadened to include forecasts of natural disasters, war, and other events that occur within human affairs6. Astrology naturally progressed into useful advice for kings and emperors, and in time, for humanity as well. Johannes Kepler is a good example of how we used to predict astronomy. Kepler spent much of his career as an Imperial Mathematician of Prussia drawing horoscopes, except he didn’t take too much interest in astrology. Astrology and astronomy were thought to be the same science until the Middle Ages, or more specifically, the 16th century. Astrology was considered heresy superstition by the church because it was supposed to be a collection of theories that is not based on fact. Galileo was tried for heresy due to his physical beliefs which contradicted geocentrism, however there is no truth to whether he was found guilty or not. Since around the late 17th century, astrology has been viewed as only entertainment. Around the 20th-21st century, we read our sun sign based on horoscopes everywhere and are also seen as entertainment. While the Babylonians were the first people to apply myths to astrology, the Greeks shaped astrology into a modern form, like one today. They borrowed myths from Babylonians and they also made their own up. The Egyptians also followed the Babylonian system, but they also refined it. The words astronomy and astrology is derived from the Greek word for star, which is “asteri”7. In 280 BC, Astrology and the culture of the Babylonians was taught to locals. A priest of Bef from Babylon known as Berossus travelled to Greece to teach this. Astrology then developed into two forms in the first century BC: to understand human behaviour: general and individual; and as a form of dialogue with the divine8. The Babylonians divided the zodiac into twelve signs of thirty equal degrees each, which is now what we use today as astrological signs. The earliest Greek text of Astrology, Anaphoricus of Hypsicles of Alexandria in 190 BC, showed the earliest signs of the zodiacs. Ptolemy, who lived in the 2nd century, worked with Tetrabiblos and laid the foundations of the Western astrological tradition. This was three centuries after the discovery of the procession of the equinoxes (Hipparchus, 130 BC). The precession of the equinoxes refers to the observable phenomena of the rotation of the heavens, a cycle which spans a period of (approximately) 25,920 years, and over that time the constellations appear to slowly rotate around the Earth, taking turns at rising behind the rising sun on the vernal equinox9. The zodiac is aligned with the equinoxes and solstices, rather than the visible constellations with the same names as the zodiacs. What this means, in part, is that the zodiac signs attributed to months as we know them were actually different when they were first organized. The Zodiac wheel begins on the first day of spring, and the corresponding zodiac constellation would be Aries. The Ancient Babylonians documented positions of wandering planets, using the constellations as markers. The star constellations are not the actual zodiac signs because they just are clusters of stars mimicking the shapes corresponding to the zodiacs. The constellations are named after the zodiac signs that they represent. More interesting, the signs of the zodiacs are subdivided into four groups: the fire signs (Aries, Sagittarius, Leo), water signs (Cancer, Scorpio, Pisces), air signs (Libra, Aquarius, Gemini), and the earth signs (Capricorn, Taurus, Virgo)10. There have been studies conducted in regard to how the brain can actually trick itself into believing horoscopes and personality tests. This phenomenon is called the Barnum Effect, also known as the Forer Effect. The way it works is the people who make horoscope or read fortunes use statements that could apply to anyone but are worded as if they are specific to one person13. What this accomplishes is tricking the brain into believing that something written for a wide, diverse audience is actually just for them because of the vague statements. One of the first and most well-known versions of the experiment to test this effect was run by a Professor Forer in 194914. What he did was give his students a personality quiz and then once they were finished, he handed them all identical evaluations about their personalities. The first three points were as follows: “You have a great need for other people to like and admire you”; “You have a tendency to be critical of yourself”, and “You have a great deal of unused capacity which you have not turned to your advantage”15. When the class was asked to rate how accurate they felt the statements were on a scale of 1-5, the class average was 4.26 successful, out of a possible 516. 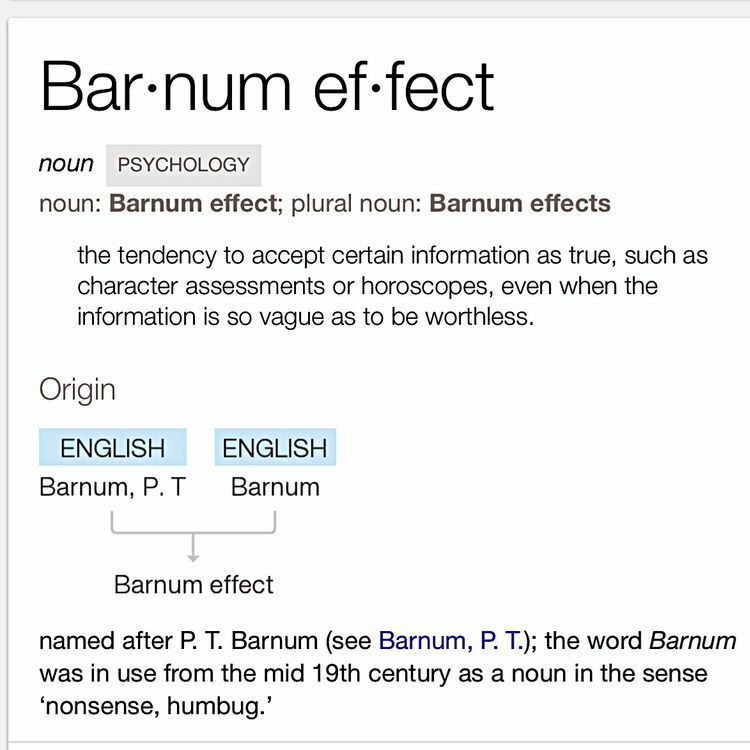 The prevailing theory around why the Barnum Effect takes place is one’s gullibility, according to Forer. This has to do with the brain’s want for these things to be true in some sense, rather than measuring if these things are actually true17. The Horoscopes one reads in Cosmopolitan on Mondays or in the weekly newspaper sometimes seem to freakily match who we are as a person. The fact that this occurs is merely a coincidence and not factual. A Horoscope does not cause one to think, feel or do a specific way. There are no truths within a Horoscope thus humans infer causation from coincidence. What all this means is that while zodiacs and horoscopes are fun to play around with, they have zero scientific merit and beyond that, the notion that a horoscope may be right about you is simply because of the Barnum Effect18. Astronomy has been studied, observed, and explored for centuries. Often tied in with astronomy is the study of astrology as they were considered the same science for over 2000 years. However, astrology is no longer viewed as a science at all, and can only be seen as a pseudoscience. Whether studying mundane or natal astrology, it does not change the fact that it is only there for pure entertainment dating back to the 17th century. The Barnum Effect demonstrates why astrology will only ever be for pure entertainment. Science indicates that astrology and zodiac signs are nothing more than what a person’s mind wants to believe or accept. Although it has been around for a number of centuries, astrology is based on a process of observation and analysis of the constellations. Astrology and astronomy have always been linked. We can now understand that although they are often associated with each other, they are not as similar as one would think, astronomy being a direct science, and astrology being a pseudoscience for pure amusement. 17 B. R. Forer, 19, 119 (n.a.) Journal of Abnormal and Social Psychology. The fallacy of personal validation: A classroom demonstration of gullibility.